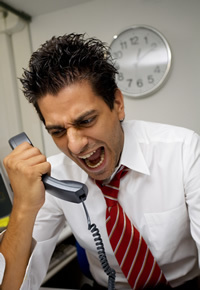 You are here: Home / Customer Service / How Do You Handle Upset Customers? When products or services do not work as promised and returns or complaints are in order, you can guarantee that from time to time your customer service department is going to have to handle argumentative, unruly customers. In fact, the higher the emotions run and the more frustrated the customer becomes, the greater the likelihood that the customer will spout out offensive language, insults, and unreasonable demands. So, as the customer service representative, how do you handle this? Do you respond with equally vulgar language? Do you return the insults and yell back? If the conflict is occurring face to face in your store, do you fight back in front of other customers? Although you may lose your patience and cool in the heat of the moment, actively arguing with the customer will offer one possible outcome. You may win the argument, but you will definitely lose the customer (and possibly the 10-15 friends they tell). So, next time you have a customer in your face spewing insults, think about the repercussions before you act. Yes, it is so tempting to yell back. However, this method is rather ineffective. As the professional, you must regain a certain level of control. The moment you begin losing your composure, the situation will quickly spiral out of control. If you want to keep the situation contained and effectively reach a resolve, you must maintain your composure. Let the customer have their 5 minutes to explain their side of the story. Most times, the customer will tire quickly of repeating the same thing over and over. Once they feel they have justified their side, you can then respond. Do not argue or suggest that they are wrong. Rather, offer an apology. Yes, an apology. You are not saying that your store is wrong. Instead, you are acknowledging that you are sorry that this situation is occurring. During the entire ordeal, speak in a calm, efficient manner. Try speaking softly to get the customer to listen more clearly and perhaps lower their own voice. Resist temptation and avoid replying to offensive comments with remarks of your own. Many feel that using harsh, offensive words add emphasis to their story or defense. However, in fact, harsh words really add little to the argument, other than vulgarity. If the situation is out of control and the customer is actually becoming verbally or physically abusive, immediately pass the situation on to a member of management. Always try your best to reach an acceptable resolution for the customer. This may mean handing off the situation to management. Or, this may mean you have to do some research. Don’t make promises to a customer that you are unable to keep. Instead, promise to find a resolution. If the situation is above you, immediately pass it off to management. If the argument is occurring at the front of the store, it is important to quickly handle it before other customers begin to gravitate. Consider the ramifications if an argument becomes so loud that other customers are uncomfortable. Chances are they will sympathize with the customer and think poorly of the employee. They may leave and take their business elsewhere. After a resolution is met, do a follow up. Even if a member of management offered the resolution, take a few moments to call the customer and ensure that they are satisfied with the end results. Your follow up will prove that you value them as a customer. Very few professionals would ever encourage or allow you to argue with a customer. Instead, your level of professionalism, patience, and control can help you regain the situation and reach a resolution faster. I actually argue back with them but it’s only if they keep nagging on about something. Surprisingly I’ve never been fired for it but I would like to be more relaxed in situations like these.